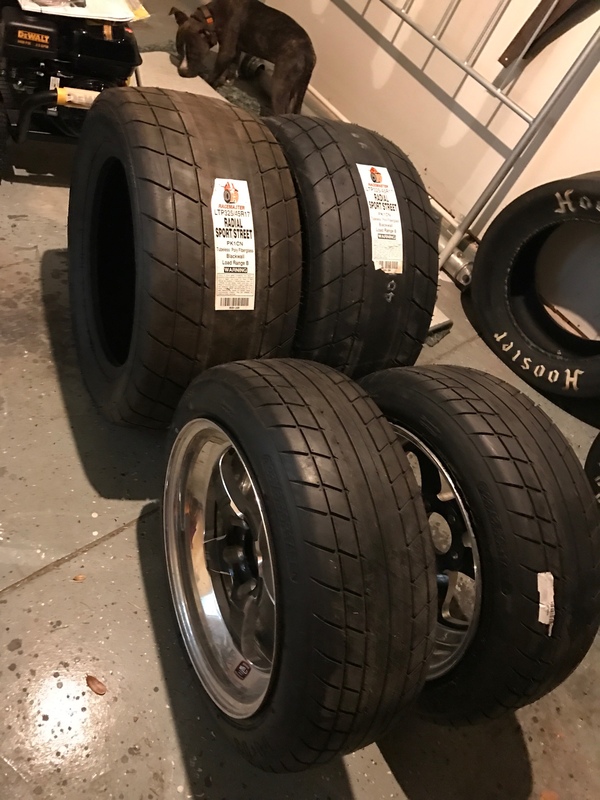 I am looking to sell my Weld RT-S wheels (specs below) and tires. Three of the wheels have nicks on the inner part of the wheel due to attempting to fit on friends car. Purchased new, rears were $500 & fronts were $480 a piece. Looking to sell them all at $1400 o.b.o. Willing to split up front or rear set. Shipping will be from San Antonio, TX (zip 78229, buyer responsible for shipping cost). Backspacing (in): 5.3 Back Sp. I also have a used set of rear Hoosier slicks that I will include for $100 a piece. And one front skinny tire for $50. Rear Tread life ends at bottom mark of black line. I think you posted on racing junk and I left you voice mail message. BUMP TTT, $1400 obo!! Reasonable offers will be considered. How much for the rears. I've actually decided to keep the rears for now and move them to the front on M&H radials and run different wheels in the back with a M&H 325 radial.